For other uses, see RELA Corps. Transcription factor p65 also known as nuclear factor NF-kappa-B p65 subunit is a protein that in humans is encoded by the RELA gene. RELA, also known as p65, is a REL-associated protein involved in NF-κB heterodimer formation, nuclear translocation and activation. NF-κB is an essential transcription factor complex involved in all types of cellular processes, including cellular metabolism, chemotaxis, etc. Phosphorylation and acetylation of RELA are crucial post-translational modifications required for NF-κB activation. RELA has also been shown to modulate immune responses, and activation of RELA is positively associated with multiple types of cancer. RELA, or v-rel avian reticuloendotheliosis viral oncogene homolog A, is also known as p65 or NFKB3. It is located on chromosome 11 q13, and its nucleotide sequence is 1473 nucleotide long. 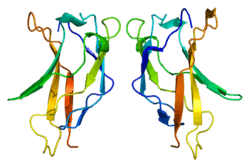 RELA protein has four isoforms, the longest and the predominant one being 551 amino acids. RELA is expressed alongside p50 in various cell types, including epithelial/endothelial cells and neuronal tissues. RELA is one member of the NF-κB family, one of the most essential transcription factors under intensive study. Seven proteins encoded by five genes are involved in the NF-κB complex, namely p105, p100, p50, p52, RELA, c-REL and RELB. Like other proteins in this complex, RELA contains a N-terminal REL-homology domain (RHD), and also a C-terminal transactivation domain (TAD). RHD is involved in DNA binding, dimerization and NF-κB/REL inhibitor interaction. On the other hand, TAD is responsible for interacting with the basal transcription complex including many coactivators of transcription such as TBP, TFIIB and CREB-CBP. RELA and p50 is the mostly commonly found heterodimer complex among NF-κB homodimers and heterodimers, and is the functional component participating in nuclear translocation and activation of NF-κB. Phosphorylation of RELA plays a key role in regulating NF-κB activation and function. Subsequent to NF-κB nuclear translocation, RELA undergoes site-specific post-translational modifications to further enhance the NF-κB function as a transcription factor. RELA can either be phosphorylated in the RHD region or the TAD region, attracting different interaction partners. Triggered by lipopolysaccharide (LPS), protein kinase A (PKA) specifically phosphorylates serine 276 in the RHD domain in the cytoplasm, controlling NF-κB DNA-binding and oligomerization. On the other hand, mitogen and stress-activated kinase 1 (MSK1) are also able to phosphorylate RELA at residue 276 under TNFα induction in the nucleus, increasing NF-κB response at the transcriptional level. Phosphorylation of serine 311 by protein kinase C zeta type (PKCζ) serves the same purpose. Two residues in the TAD region are targeted by phosphorylation. After IL-1or TNFα stimulation, serine 529 is phosphorylated by casein kinase II (CKII), while serine 536 is phosphorylated by IκB kinases (IKKs). In response to DNA damage, ribosomal subunit kinase-1 (RSK1) also has the ability to phosphorylate RELA at serine 536 in a p53-dependent manner. A couple of other kinases are also able to phosphorylate RELA at different conditions, including glycogen-synthase kinase-3β (GSK3β), AKT/phosphatidylinositol 3-kinase (PI3K) and NF-κB activating kinase (NAK, i.e. TANK-binding kinase-1 (TBK1) and TRAF2-associated kinase (T2K)). The fact that RELA can be modified by a collection of kinases via phosphorylation at different sites/regions within the protein under different stimulations might suggest a synergistic effect of these modifications. Phosphorylation at these sites enhances NF-κB transcriptional response via tightened binding to transcription coactivators. For example, CBP and p300 binding to RELA are enhanced when serine 276 or 311 is phosphorylated. Status of several phosphorylation sites determines RELA stability mediated by the ubiquitin-mediated proteolysis. Cell-type-specific phosphorylation is also observed for RELA. Multiple-site phosphorylation is common in endothelial cells, and different cell types may contain different stimuli, leading to targeted phosphorylation of RELA by different kinases. For instance, IKK2 is found to be mainly responsible for phosphorylating serine 536 in monocytes and macrophages, or in CD40 receptor binding in hepatic stellate cells. IKK1 functions as the major kinase phosphorylating serine 536 under different stimuli, such as the ligand activation of the lymphotoxin-β receptor (LTβR). In vivo studies revealed that RELA is also under acetylation modification in the nucleus, which is just as important as phosphorylation as a post-translational modification of proteins. Lysines 218, 221 and 310 are acetylation targets within RELA, and response to actylation is site-specific. For instance, lysine 221 acetylation facilitates RELA dissociation from IκBα and enhances its DNA-binding affinity. Lysine 310 acetylation is indispensable for the full transcriptional activity of RELA, but does not affect its DNA-binding ability. Hypothesis about RELA acetylation suggests acetylation aids its subsequent recognition by transcriptional co-activators with bromodomains, which are specialized in recognizing acetylated lysine residues. Lysine 122 and 123 acetylation are found to be negatively correlated with RELA transcriptional activation. Unknown mechanisms mediate the acetylation of RELA possibly using p300/CBP and p300/CBP factor associated coactivators under TNFα or phorbol myristate acetate (PMF) stimulation both in vivo and in vitro. RELA is also under the control of deactylation via HDAC, and HDAC3 is the mediator of this process both in vivo and in vitro. Methylation of lysine 218 and 221 together or lysine 37 alone in the RHD domain of RELA can lead to increased response to cytokines such as IL-1 in mammalian cell culture. As the prototypical heterodimer complex member of the NF-κB, together with p50, RELA/p65 interacts with various proteins in both the cytoplasm and in the nucleus during the process of classical NF-κB activation and nuclear translocation. In the inactive state, RELA/p50 complex is mainly sequestered by IκBα in the cytosol. TNFα, LPS and other factors serve as activation inducers, followed by phosphorylation at residue 32 and 36 of IκBα, leading to rapid degradation of IκBα via the ubiquitin-proteasomal system and subsequent release of RELA/p50 complex. RELA nuclear localization signal used to be sequestered by IκBα is now exposed, and rapid translocation of the NF-κB occurs. In parallel, there is a non-classical NF-κB activation pathway involving the proteolytic cleavage of p100 into p52 instead of p50. This process does not require RELA, hence will not be discussed in detail here. After NF-κB nuclear localization due to TNFα stimulation, p50/RELA heterodimer will function as a transcription factor and bind to a variety of genes involved in all kinds of biological processes, such as leukocyte activation/chemotaxis, negative regulation of TNFIKK pathway, cellular metabolism, antigen processing, just to name a few . Phosphorylation of RELA at different residues also enables its interaction with CDKs and P-TEFb. Phosphorylation at serine 276 in RELA allows its interaction with P-TEFb containing CDK9 and cyclin T1 subunits, and phospho-ser276 RELA-P-TEFb complex is necessary for IL-8 and Gro-β activation. Another mechanism is involved in the activation of genes preloaded with Pol II in a RELA serine 276 phosphorylation independent manner. Gene knockout of NF-κB genes via homologous recombination in mice showed the role of these components in innate and adaptive immune responses. RELA knockout mice is embryonic lethal due to liver apoptosis. Lymphocyte activation failure is also observed, suggesting that RELA is indispensable in the proper development of the immune system. In comparison, deletion of other REL-related genes will not cause embryonic development failure, though different levels of defects are also noted. The fact that cytokines such as TNFα and IL-1 can stimulate the activation of RELA also supports its participation in immune response. In general, RELA participates in adaptive immunity and responses to invading pathogens via NF-κB activation. Mice without individual NF-κB proteins are deficient in B- and T-cell activation and proliferation, cytoline production and isotype switching. Mutations in RELA is found responsible for inflammatory bowel disease as well. NF-κB/RELA activation has been found to be correlated with cancer development, suggesting the potential of RELA as a cancer biomarker. Specific modification patterns of RELA have also been observed in many cancer types. RELA may have a potential role as biomarker for prostate cancer progression and metastases, as suggested by the association found between RELA nuclear localization and prostate cancer aggressiveness and biochemical recurrence. Strong correlation between nuclear localization of RELA and clinicopathological parameters for papillary thyroid carcinoma (PTC), suggesting the role of NF-κB activation in tumor growth and aggressiveness in PTC. Other than usage as an biomarker, serine 536 phosphorylation in RELA is also correlated with nuclear translocation and the expression of some transactivating genes such as COX-2, IL-8 and GST-pi in follicular thyroid carcinomas via morphoproteomic analysis. Mutations in the transactivation domain of RELA can lead to decrease in transactivating ability and this mutation can be found in lymphoid neoplasia. Nuclear localization of NF-κB/RELA is positively correlated with tumor micrometastases into lymph and blood and negatively correlated with patient survival outcome in patients with head and neck squamous cell carcinoma (HNSCC). This suggests a role of NF-κB/RELA as a possible target for targeted-therapy. There is both a physical and a functional association between RELA and aryl hydrocarbon receptor (AhR), and the subsequent activation of c-myc gene transcription in breast cancer cells. Another paper reported interactions between estrogen receptor (ER) and NF-κB members, including p50 and RELA. It is shown that ERα interacts with both p50 and RELA in vitro and in vivo, and RELA antibody can reduce ERα:ERE complex formation. The paper claims a mutual repression between ER and NF-κB. ↑ Nolan GP, Ghosh S, Liou HC, Tempst P, Baltimore D (Mar 1991). "DNA binding and I kappa B inhibition of the cloned p65 subunit of NF-kappa B, a rel-related polypeptide". Cell. 64 (5): 961–9. doi:10.1016/0092-8674(91)90320-X. PMID 2001591. ↑ "RELA v-rel avian reticuloendotheliosis viral oncogene homolog A [Homo sapiens (human)]". Gene. National Center for Biotechnology Information (NCBI), U.S. National Library of Medicine. ↑ "Homo sapiens p65 gene for p65 subunit of transcription factor NF-kappa". Nucleotide. National Center for Biotechnology Information (NCBI), U.S. National Library of Medicine. 1 2 3 4 5 6 7 8 Li Q, Verma IM (Oct 2002). "NF-kappaB regulation in the immune system". Nature Reviews. Immunology. 2 (10): 725–34. doi:10.1038/nri910. PMID 12360211. 1 2 3 4 5 6 7 8 9 10 Chen LF, Greene WC (May 2004). "Shaping the nuclear action of NF-kappaB". Nature Reviews Molecular Cell Biology. 5 (5): 392–401. doi:10.1038/nrm1368. PMID 15122352. ↑ Zhong H, Voll RE, Ghosh S (Apr 1998). "Phosphorylation of NF-kappa B p65 by PKA stimulates transcriptional activity by promoting a novel bivalent interaction with the coactivator CBP/p300". Molecular Cell. 1 (15): 661–71. doi:10.1016/S1097-2765(00)80066-0. PMID 9660950. 1 2 Vermeulen L, De Wilde G, Van Damme P, Vanden Berghe W, Haegeman G (Mar 2003). "Transcriptional activation of the NF-kappaB p65 subunit by mitogen- and stress-activated protein kinase-1 (MSK1)". The EMBO Journal. 22 (6): 1313–24. doi:10.1093/emboj/cdg139. PMID 12628924. ↑ Duran A, Diaz-Meco MT, Moscat J (Aug 2003). "Essential role of RelA Ser311 phosphorylation by zetaPKC in NF-kappaB transcriptional activation". The EMBO Journal. 22 (15): 3910–8. doi:10.1093/emboj/cdg370. PMID 12881425. ↑ Wang D, Westerheide SD, Hanson JL, Baldwin AS (Oct 2000). "Tumor necrosis factor alpha-induced phosphorylation of RelA/p65 on Ser529 is controlled by casein kinase II". The Journal of Biological Chemistry. 275 (42): 32592–7. doi:10.1074/jbc.M001358200. PMID 10938077. ↑ Bohuslav J, Chen LF, Kwon H, Mu Y, Greene WC (Jun 2004). "p53 induces NF-kappaB activation by an IkappaB kinase-independent mechanism involving phosphorylation of p65 by ribosomal S6 kinase 1". The Journal of Biological Chemistry. 279 (25): 26115–25. doi:10.1074/jbc.M313509200. PMID 15073170. 1 2 3 Ryo A, Suizu F, Yoshida Y, Perrem K, Liou YC, Wulf G, Rottapel R, Yamaoka S, Lu KP (Dec 2003). "Regulation of NF-kappaB signaling by Pin1-dependent prolyl isomerization and ubiquitin-mediated proteolysis of p65/RelA". Molecular Cell. 12 (6): 1413–26. doi:10.1016/S1097-2765(03)00490-8. PMID 14690596. ↑ Geng H, Wittwer T, Dittrich-Breiholz O, Kracht M, Schmitz ML (April 2009). "Phosphorylation of NF-kappaB p65 at Ser468 controls its COMMD1-dependent ubiquitination and target gene-specific proteasomal elimination". EMBO Reports. 10 (4): 381–6. doi:10.1038/embor.2009.10. PMC 2672889 . PMID 19270718. 1 2 Nihira K, Ando Y, Yamaguchi T, Kagami Y, Miki Y, Yoshida K (Apr 2010). "Pim-1 controls NF-kappaB signalling by stabilizing RelA/p65". Cell Death and Differentiation. 17 (4): 689–98. doi:10.1038/cdd.2009.174. PMID 19911008. ↑ Lua T, Yang M, Huang D, Wei H, Ozer GH, Ghosh G, Stark GR (2013). "Role of lysine methylation of NF-κB in differential gene regulation". Proc. Natl. Acad. Sci. USA. 110 (33): 13510–5. doi:10.1073/pnas.1311770110. PMID 23904479. 1 2 Nowak DE, Tian B, Jamaluddin M, Boldogh I, Vergara LA, Choudhary S, Brasier AR (Jun 2008). "RelA Ser276 phosphorylation is required for activation of a subset of NF-kappaB-dependent genes by recruiting cyclin-dependent kinase 9/cyclin T1 complexes". Molecular and Cellular Biology. 28 (11): 3623–38. doi:10.1128/MCB.01152-07. PMC 2423290 . PMID 18362169. ↑ Tomita S, Fujita T, Kirino Y, Suzuki T (Apr 2000). "PDZ domain-dependent suppression of NF-kappaB/p65-induced Abeta42 production by a neuron-specific X11-like protein". The Journal of Biological Chemistry. 275 (17): 13056–60. doi:10.1074/jbc.C000019200. PMID 10777610. 1 2 Kim DW, Gazourian L, Quadri SA, Romieu-Mourez R, Sherr DH, Sonenshein GE (Nov 2000). "The RelA NF-kappaB subunit and the aryl hydrocarbon receptor (AhR) cooperate to transactivate the c-myc promoter in mammary cells". Oncogene. 19 (48): 5498–506. doi:10.1038/sj.onc.1203945. PMID 11114727. ↑ Ruby CE, Leid M, Kerkvliet NI (Sep 2002). "2,3,7,8-Tetrachlorodibenzo-p-dioxin suppresses tumor necrosis factor-alpha and anti-CD40-induced activation of NF-kappaB/Rel in dendritic cells: p50 homodimer activation is not affected". Molecular Pharmacology. 62 (3): 722–8. doi:10.1124/mol.62.3.722. PMID 12181450. ↑ Jung DJ, Sung HS, Goo YW, Lee HM, Park OK, Jung SY, Lim J, Kim HJ, Lee SK, Kim TS, Lee JW, Lee YC (Jul 2002). "Novel transcription coactivator complex containing activating signal cointegrator 1". Molecular and Cellular Biology. 22 (14): 5203–11. doi:10.1128/MCB.22.14.5203-5211.2002. PMC 139772 . PMID 12077347. ↑ Benezra M, Chevallier N, Morrison DJ, MacLachlan TK, El-Deiry WS, Licht JD (Jul 2003). "BRCA1 augments transcription by the NF-kappaB transcription factor by binding to the Rel domain of the p65/RelA subunit". The Journal of Biological Chemistry. 278 (29): 26333–41. doi:10.1074/jbc.M303076200. PMID 12700228. 1 2 Spencer E, Jiang J, Chen ZJ (Feb 1999). "Signal-induced ubiquitination of IkappaBalpha by the F-box protein Slimb/beta-TrCP". Genes & Development. 13 (3): 284–94. doi:10.1101/gad.13.3.284. PMC 316434 . PMID 9990853. 1 2 Yang X, Chen Y, Gabuzda D (Sep 1999). "ERK MAP kinase links cytokine signals to activation of latent HIV-1 infection by stimulating a cooperative interaction of AP-1 and NF-kappaB". The Journal of Biological Chemistry. 274 (39): 27981–8. doi:10.1074/jbc.274.39.27981. PMID 10488148. ↑ Amini S, Clavo A, Nadraga Y, Giordano A, Khalili K, Sawaya BE (Aug 2002). "Interplay between cdk9 and NF-kappaB factors determines the level of HIV-1 gene transcription in astrocytic cells". Oncogene. 21 (37): 5797–803. doi:10.1038/sj.onc.1205754. PMID 12173051. ↑ Weber M, Sydlik C, Quirling M, Nothdurfter C, Zwergal A, Heiss P, Bell S, Neumeier D, Ziegler-Heitbrock HW, Brand K (Jun 2003). "Transcriptional inhibition of interleukin-8 expression in tumor necrosis factor-tolerant cells: evidence for involvement of C/EBP beta". The Journal of Biological Chemistry. 278 (26): 23586–93. doi:10.1074/jbc.M211646200. PMID 12707271. ↑ Xia C, Cheshire JK, Patel H, Woo P (Dec 1997). "Cross-talk between transcription factors NF-kappa B and C/EBP in the transcriptional regulation of genes". The International Journal of Biochemistry & Cell Biology. 29 (12): 1525–39. doi:10.1016/S1357-2725(97)00083-6. PMID 9570146. ↑ Chumakov A, Silla A, Williamson E, Koeffler HP (May 2007). "Modulation of DNA binding properties of CCAAT/enhancer binding protein epsilon by heterodimer formation and interactions with NFkappaB pathway". Blood. 109 (10): 4209–4219. doi:10.1182/blood-2005-09-031963. PMID 17255362. 1 2 Jang HD, Yoon K, Shin YJ, Kim J, Lee SY (Jun 2004). "PIAS3 suppresses NF-kappaB-mediated transcription by interacting with the p65/RelA subunit". The Journal of Biological Chemistry. 279 (23): 24873–80. doi:10.1074/jbc.M313018200. PMID 15140884. 1 2 Zhong H, May MJ, Jimi E, Ghosh S (Mar 2002). "The phosphorylation status of nuclear NF-kappa B determines its association with CBP/p300 or HDAC-1". Molecular Cell. 9 (3): 625–36. doi:10.1016/S1097-2765(02)00477-X. PMID 11931769. ↑ Parry GC, Mackman N (Dec 1997). "Role of cyclic AMP response element-binding protein in cyclic AMP inhibition of NF-kappaB-mediated transcription". Journal of Immunology. 159 (11): 5450–6. PMID 9548485. ↑ Aarnisalo P, Palvimo JJ, Jänne OA (Mar 1998). "CREB-binding protein in androgen receptor-mediated signaling". Proceedings of the National Academy of Sciences of the United States of America. 95 (5): 2122–7. doi:10.1073/pnas.95.5.2122. PMC 19270 . PMID 9482849. 1 2 Gerritsen ME, Williams AJ, Neish AS, Moore S, Shi Y, Collins T (Apr 1997). "CREB-binding protein/p300 are transcriptional coactivators of p65". Proceedings of the National Academy of Sciences of the United States of America. 94 (7): 2927–32. doi:10.1073/pnas.94.7.2927. PMC 20299 . PMID 9096323. ↑ Hochrainer K, Racchumi G, Zhang S, Iadecola C, Anrather J (Jun 2012). "Monoubiquitination of nuclear RelA negatively regulates NF-κB activity independent of proteasomal degradation". Cellular and Molecular Life Sciences. 69 (12): 2057–73. doi:10.1007/s00018-011-0912-2. PMID 22261743. 1 2 Wang D, Westerheide SD, Hanson JL, Baldwin AS (Oct 2000). "Tumor necrosis factor alpha-induced phosphorylation of RelA/p65 on Ser529 is controlled by casein kinase II". The Journal of Biological Chemistry. 275 (42): 32592–7. doi:10.1074/jbc.M001358200. PMID 10938077. ↑ Tetsuka T, Uranishi H, Sanda T, Asamitsu K, Yang JP, Wong-Staal F, Okamoto T (Sep 2004). "RNA helicase A interacts with nuclear factor kappaB p65 and functions as a transcriptional coactivator". European Journal of Biochemistry / FEBS. 271 (18): 3741–51. doi:10.1111/j.1432-1033.2004.04314.x. PMID 15355351. 1 2 3 4 Kiernan R, Brès V, Ng RW, Coudart MP, El Messaoudi S, Sardet C, Jin DY, Emiliani S, Benkirane M (Jan 2003). "Post-activation turn-off of NF-kappa B-dependent transcription is regulated by acetylation of p65". The Journal of Biological Chemistry. 278 (4): 2758–66. doi:10.1074/jbc.M209572200. PMID 12419806. ↑ Higashitsuji H, Higashitsuji H, Nagao T, Nonoguchi K, Fujii S, Itoh K, Fujita J (Oct 2002). "A novel protein overexpressed in hepatoma accelerates export of NF-kappa B from the nucleus and inhibits p53-dependent apoptosis". Cancer Cell. 2 (4): 335–46. doi:10.1016/S1535-6108(02)00152-6. PMID 12398897. ↑ Uranishi H, Tetsuka T, Yamashita M, Asamitsu K, Shimizu M, Itoh M, Okamoto T (Apr 2001). "Involvement of the pro-oncoprotein TLS (translocated in liposarcoma) in nuclear factor-kappa B p65-mediated transcription as a coactivator". The Journal of Biological Chemistry. 276 (16): 13395–401. doi:10.1074/jbc.M011176200. PMID 11278855. ↑ Mao X, Gluck N, Li D, Maine GN, Li H, Zaidi IW, Repaka A, Mayo MW, Burstein E (Apr 2009). "GCN5 is a required cofactor for a ubiquitin ligase that targets NF-kappaB/RelA". Genes & Development. 23 (7): 849–61. doi:10.1101/gad.1748409. PMID 19339690. ↑ Ashburner BP, Westerheide SD, Baldwin AS (Oct 2001). "The p65 (RelA) subunit of NF-kappaB interacts with the histone deacetylase (HDAC) corepressors HDAC1 and HDAC2 to negatively regulate gene expression". Molecular and Cellular Biology. 21 (20): 7065–77. doi:10.1128/MCB.21.20.7065-7077.2001. PMC 99882 . PMID 11564889. ↑ Yu Z, Zhang W, Kone BC (Aug 2002). "Histone deacetylases augment cytokine induction of the iNOS gene". Journal of the American Society of Nephrology. 13 (8): 2009–17. doi:10.1097/01.ASN.0000024253.59665.F1. PMID 12138131. 1 2 Fischle W, Verdin E, Greene WC (Aug 2001). "Duration of nuclear NF-kappaB action regulated by reversible acetylation". Science. 293 (5535): 1653–7. doi:10.1126/science.1062374. PMID 11533489. ↑ Garkavtsev I, Kozin SV, Chernova O, Xu L, Winkler F, Brown E, Barnett GH, Jain RK (Mar 2004). "The candidate tumour suppressor protein ING4 regulates brain tumour growth and angiogenesis". Nature. 428 (6980): 328–32. doi:10.1038/nature02329. PMID 15029197. ↑ Hay DC, Kemp GD, Dargemont C, Hay RT (May 2001). "Interaction between hnRNPA1 and IkappaBalpha is required for maximal activation of NF-kappaB-dependent transcription". Molecular and Cellular Biology. 21 (10): 3482–90. doi:10.1128/MCB.21.10.3482-3490.2001. PMC 100270 . PMID 11313474. 1 2 Hansen SK, Baeuerle PA, Blasi F (Apr 1994). "Purification, reconstitution, and I kappa B association of the c-Rel-p65 (RelA) complex, a strong activator of transcription". Molecular and Cellular Biology. 14 (4): 2593–603. doi:10.1128/mcb.14.4.2593. PMC 358627 . PMID 8139561. ↑ Malek S, Huxford T, Ghosh G (Sep 1998). "Ikappa Balpha functions through direct contacts with the nuclear localization signals and the DNA binding sequences of NF-kappaB". The Journal of Biological Chemistry. 273 (39): 25427–35. doi:10.1074/jbc.273.39.25427. PMID 9738011. ↑ Cohen L, Henzel WJ, Baeuerle PA (Sep 1998). "IKAP is a scaffold protein of the IkappaB kinase complex". Nature. 395 (6699): 292–6. doi:10.1038/26254. PMID 9751059. ↑ Chen HL, Chong IW, Lee YC, Tsai JR, Yuan SS, Wang HM, Liu WL, Liu PL (Aug 2014). "Krüppel-like factor 5 mediates proinflammatory cytokine expression in lipopolysaccharide-induced acute lung injury through upregulation of nuclear factor-κB phosphorylation in vitro and in vivo.". Mediators of Inflammation. 2014 (2014): 281984. doi:10.1155/2014/281984. PMID 25197166. ↑ Heyne K, Winter C, Gerten F, Schmidt C, Roemer K (Aug 2013). "A novel mechanism of crosstalk between the p53 and NFκB pathways: MDM2 binds and inhibits p65RelA". Cell Cycle. 12 (15): 2479–92. doi:10.4161/cc.25495. PMID 23839035. ↑ Heppner C, Bilimoria KY, Agarwal SK, Kester M, Whitty LJ, Guru SC, Chandrasekharappa SC, Collins FS, Spiegel AM, Marx SJ, Burns AL (Aug 2001). "The tumor suppressor protein menin interacts with NF-kappaB proteins and inhibits NF-kappaB-mediated transactivation". Oncogene. 20 (36): 4917–25. doi:10.1038/sj.onc.1204529. PMID 11526476. ↑ Knuefermann P, Chen P, Misra A, Shi SP, Abdellatif M, Sivasubramanian N (Jun 2002). "Myotrophin/V-1, a protein up-regulated in the failing human heart and in postnatal cerebellum, converts NFkappa B p50-p65 heterodimers to p50-p50 and p65-p65 homodimers". The Journal of Biological Chemistry. 277 (26): 23888–97. doi:10.1074/jbc.M202937200. PMID 11971907. ↑ Gu Y, Xu YC, Wu RF, Nwariaku FE, Souza RF, Flores SC, Terada LS (May 2003). "p47phox participates in activation of RelA in endothelial cells". The Journal of Biological Chemistry. 278 (19): 17210–7. doi:10.1074/jbc.M210314200. PMID 12618429. 1 2 3 Bouwmeester T, Bauch A, Ruffner H, Angrand PO, Bergamini G, Croughton K, Cruciat C, Eberhard D, Gagneur J, Ghidelli S, Hopf C, Huhse B, Mangano R, Michon AM, Schirle M, Schlegl J, Schwab M, Stein MA, Bauer A, Casari G, Drewes G, Gavin AC, Jackson DB, Joberty G, Neubauer G, Rick J, Kuster B, Superti-Furga G (Feb 2004). "A physical and functional map of the human TNF-alpha/NF-kappa B signal transduction pathway". Nature Cell Biology. 6 (2): 97–105. doi:10.1038/ncb1086. PMID 14743216. ↑ Palvimo JJ, Reinikainen P, Ikonen T, Kallio PJ, Moilanen A, Jänne OA (Sep 1996). "Mutual transcriptional interference between RelA and androgen receptor". The Journal of Biological Chemistry. 271 (39): 24151–6. doi:10.1074/jbc.271.39.24151. PMID 8798655. ↑ Scheinman RI, Beg AA, Baldwin AS (Oct 1993). "NF-kappa B p100 (Lyt-10) is a component of H2TF1 and can function as an I kappa B-like molecule". Molecular and Cellular Biology. 13 (10): 6089–101. doi:10.1128/mcb.13.10.6089. PMC 364669 . PMID 8413211. ↑ Chen Y, Wu J, Ghosh G (Jun 2003). "KappaB-Ras binds to the unique insert within the ankyrin repeat domain of IkappaBbeta and regulates cytoplasmic retention of IkappaBbeta x NF-kappaB complexes". The Journal of Biological Chemistry. 278 (25): 23101–6. doi:10.1074/jbc.M301021200. PMID 12672800. ↑ Suyang H, Phillips R, Douglas I, Ghosh S (Oct 1996). "Role of unphosphorylated, newly synthesized I kappa B beta in persistent activation of NF-kappa B". Molecular and Cellular Biology. 16 (10): 5444–9. doi:10.1128/mcb.16.10.5444. PMC 231544 . PMID 8816457. ↑ Ray A, Prefontaine KE (Jan 1994). "Physical association and functional antagonism between the p65 subunit of transcription factor NF-kappa B and the glucocorticoid receptor". Proceedings of the National Academy of Sciences of the United States of America. 91 (2): 752–6. doi:10.1073/pnas.91.2.752. PMC 43027 . PMID 8290595. ↑ Nissen RM, Yamamoto KR (Sep 2000). "The glucocorticoid receptor inhibits NFkappaB by interfering with serine-2 phosphorylation of the RNA polymerase II carboxy-terminal domain". Genes & Development. 14 (18): 2314–29. doi:10.1101/gad.827900. PMC 316928 . PMID 10995388. ↑ Caldenhoven E, Liden J, Wissink S, Van de Stolpe A, Raaijmakers J, Koenderman L, Okret S, Gustafsson JA, Van der Saag PT (Apr 1995). "Negative cross-talk between RelA and the glucocorticoid receptor: a possible mechanism for the antiinflammatory action of glucocorticoids". Molecular Endocrinology. 9 (4): 401–12. doi:10.1210/me.9.4.401. PMID 7659084. ↑ Espinosa L, Inglés-Esteve J, Robert-Moreno A, Bigas A (Feb 2003). "IkappaBalpha and p65 regulate the cytoplasmic shuttling of nuclear corepressors: cross-talk between Notch and NFkappaB pathways". Molecular Biology of the Cell. 14 (2): 491–502. doi:10.1091/mbc.E02-07-0404. PMC 149987 . PMID 12589049. ↑ Lee SK, Kim JH, Lee YC, Cheong J, Lee JW (Apr 2000). "Silencing mediator of retinoic acid and thyroid hormone receptors, as a novel transcriptional corepressor molecule of activating protein-1, nuclear factor-kappaB, and serum response factor". The Journal of Biological Chemistry. 275 (17): 12470–4. doi:10.1074/jbc.275.17.12470. PMID 10777532. ↑ Hassa PO, Covic M, Hasan S, Imhof R, Hottiger MO (Dec 2001). "The enzymatic and DNA binding activity of PARP-1 are not required for NF-kappa B coactivator function". The Journal of Biological Chemistry. 276 (49): 45588–97. doi:10.1074/jbc.M106528200. PMID 11590148. ↑ Tanaka T, Grusby MJ, Kaisho T (Jun 2007). "PDLIM2-mediated termination of transcription factor NF-kappaB activation by intranuclear sequestration and degradation of the p65 subunit". Nature Immunology. 8 (6): 584–91. doi:10.1038/ni1464. PMID 17468759. ↑ Gao N, Hibi Y, Cueno M, Asamitsu K, Okamoto T (Sep 2010). "A-kinase-interacting protein 1 (AKIP1) acts as a molecular determinant of PKA in NF-kappaB signaling". The Journal of Biological Chemistry. 285 (36): 28097–104. doi:10.1074/jbc.M110.116566. PMID 20562110. ↑ van Heel DA, Udalova IA, De Silva AP, McGovern DP, Kinouchi Y, Hull J, Lench NJ, Cardon LR, Carey AH, Jewell DP, Kwiatkowski D (May 2002). "Inflammatory bowel disease is associated with a TNF polymorphism that affects an interaction between the OCT1 and NF(-kappa)B transcription factors". Human Molecular Genetics. 11 (11): 1281–9. doi:10.1093/hmg/11.11.1281. PMID 12019209. ↑ Hou Y, Moreau F, Chadee K (December 2012). "PPARγ is an E3 ligase that induces the degradation of NFκB/p65". Nature Communication. 3: 1300. doi:10.1038/ncomms2270. PMID 23250430. ↑ Yang JP, Hori M, Sanda T, Okamoto T (May 1999). "Identification of a novel inhibitor of nuclear factor-kappaB, RelA-associated inhibitor". The Journal of Biological Chemistry. 274 (22): 15662–70. doi:10.1074/jbc.274.22.15662. PMID 10336463. ↑ Takada N, Sanda T, Okamoto H, Yang JP, Asamitsu K, Sarol L, Kimura G, Uranishi H, Tetsuka T, Okamoto T (Aug 2002). "RelA-associated inhibitor blocks transcription of human immunodeficiency virus type 1 by inhibiting NF-kappaB and Sp1 actions". Journal of Virology. 76 (16): 8019–30. doi:10.1128/JVI.76.16.8019-8030.2002. PMC 155123 . PMID 12134007. ↑ Leitges M, Sanz L, Martin P, Duran A, Braun U, García JF, Camacho F, Diaz-Meco MT, Rennert PD, Moscat J (Oct 2001). "Targeted disruption of the zetaPKC gene results in the impairment of the NF-kappaB pathway". Molecular Cell. 8 (4): 771–80. doi:10.1016/S1097-2765(01)00361-6. PMID 11684013. ↑ Liss AS, Bose HR (May 2002). "Mutational analysis of the v-Rel dimerization interface reveals a critical role for v-Rel homodimers in transformation". Journal of Virology. 76 (10): 4928–39. doi:10.1128/JVI.76.10.4928-4939.2002. PMC 136140 . PMID 11967310. ↑ Anderson LA, Perkins ND (Jan 2003). "Regulation of RelA (p65) function by the large subunit of replication factor C". Molecular and Cellular Biology. 23 (2): 721–32. doi:10.1128/MCB.23.2.721-732.2003. PMC 151544 . PMID 12509469. ↑ Asamitsu K, Tetsuka T, Kanazawa S, Okamoto T (Jul 2003). "RING finger protein AO7 supports NF-kappaB-mediated transcription by interacting with the transactivation domain of the p65 subunit". The Journal of Biological Chemistry. 278 (29): 26879–87. doi:10.1074/jbc.M211831200. PMID 12748188. ↑ Strebovsky J, Walker P, Lang R, Dalpke AH (Mar 2011). "Suppressor of cytokine signaling 1 (SOCS1) limits NFkappaB signaling by decreasing p65 stability within the cell nucleus". The FASEB Journal. 25 (3): 863–74. doi:10.1096/fj.10-170597. PMID 21084693. ↑ Maine GN, Mao X, Komarck CM, Burstein E (Jan 2007). "COMMD1 promotes the ubiquitination of NF-kappaB subunits through a cullin-containing ubiquitin ligase". The EMBO Journal. 26 (2): 436–47. doi:10.1038/sj.emboj.7601489. PMC 1783443 . PMID 17183367. ↑ Kuang PP, Berk JL, Rishikof DC, Foster JA, Humphries DE, Ricupero DA, Goldstein RH (Jul 2002). "NF-kappaB induced by IL-1beta inhibits elastin transcription and myofibroblast phenotype". American Journal of Physiology. Cell Physiology. 283 (1): C58–65. doi:10.1152/ajpcell.00314.2001. PMID 12055073. ↑ Sif S, Gilmore TD (Nov 1994). "Interaction of the v-Rel oncoprotein with cellular transcription factor Sp1". Journal of Virology. 68 (11): 7131–8. PMC 237152 . PMID 7933095. ↑ Yu Z, Zhang W, Kone BC (Oct 2002). "Signal transducers and activators of transcription 3 (STAT3) inhibits transcription of the inducible nitric oxide synthase gene by interacting with nuclear factor kappaB". The Biochemical Journal. 367 (Pt 1): 97–105. doi:10.1042/BJ20020588. PMC 1222853 . PMID 12057007. 1 2 High-throughput sequencing identifies STAT3 as the DNA-associated factor for p53-NF-kappaB-complex-dependent gene expression in human heart failure. Genome Medicine. 2010;6(2):37. doi:10.1186/gm158. PMID 20546595. ↑ Yamit-Hezi A, Dikstein R (Sep 1998). "TAFII105 mediates activation of anti-apoptotic genes by NF-kappaB". The EMBO Journal. 17 (17): 5161–9. doi:10.1093/emboj/17.17.5161. PMC 1170844 . PMID 9724652. ↑ Guermah M, Malik S, Roeder RG (Jun 1998). "Involvement of TFIID and USA components in transcriptional activation of the human immunodeficiency virus promoter by NF-kappaB and Sp1". Molecular and Cellular Biology. 18 (6): 3234–44. doi:10.1128/mcb.18.6.3234. PMC 108905 . PMID 9584164. ↑ Schmitz ML, Stelzer G, Altmann H, Meisterernst M, Baeuerle PA (Mar 1995). "Interaction of the COOH-terminal transactivation domain of p65 NF-kappa B with TATA-binding protein, transcription factor IIB, and coactivators". The Journal of Biological Chemistry. 270 (13): 7219–26. doi:10.1074/jbc.270.13.7219. PMID 7706261. ↑ Wu M, Xu LG, Zhai Z, Shu HB (Jul 2003). "SINK is a p65-interacting negative regulator of NF-kappaB-dependent transcription". The Journal of Biological Chemistry. 278 (29): 27072–9. doi:10.1074/jbc.M209814200. PMID 12736262. ↑ Gannon PO, Lessard L, Stevens LM, Forest V, Bégin LR, Minner S, Tennstedt P, Schlomm T, Mes-Masson AM, Saad F (Jul 2013). "Large-scale independent validation of the nuclear factor-kappa B p65 prognostic biomarker in prostate cancer". European Journal of Cancer. 49 (10): 2441–8. doi:10.1016/j.ejca.2013.02.026. PMID 23541563. ↑ Pyo JS, Kang G, Kim DH, Chae SW, Park C, Kim K, Do SI, Lee HJ, Kim JH, Sohn JH (Apr 2013). "Activation of nuclear factor-κB contributes to growth and aggressiveness of papillary thyroid carcinoma". Pathology, Research and Practice. 209 (4): 228–32. doi:10.1016/j.prp.2013.02.004. PMID 23528368. ↑ Liu J, Brown RE (2012). "Morphoproteomic confirmation of an activated nuclear factor-кBp65 pathway in follicular thyroid carcinoma". International Journal of Clinical and Experimental Pathology. 5 (3): 216–23. PMC 3341672 . PMID 22558476. ↑ Trecca D, Guerrini L, Fracchiolla NS, Pomati M, Baldini L, Maiolo AT, Neri A (Feb 1997). "Identification of a tumor-associated mutant form of the NF-kappaB RelA gene with reduced DNA-binding and transactivating activities". Oncogene. 14 (7): 791–9. doi:10.1038/sj.onc.1200895. PMID 9047386. ↑ Balermpas P, Michel Y, Wagenblast J, Seitz O, Sipek F, Rödel F, Rödel C, Fokas E (Jul 2013). "Nuclear NF-κB expression correlates with outcome among patients with head and neck squamous cell carcinoma treated with primary chemoradiation therapy". International Journal of Radiation Oncology, Biology, Physics. 86 (4): 785–90. doi:10.1016/j.ijrobp.2013.04.001. PMID 23664323. ↑ Gionet N, Jansson D, Mader S, Pratt MA (Jun 2009). "NF-kappaB and estrogen receptor alpha interactions: Differential function in estrogen receptor-negative and -positive hormone-independent breast cancer cells". Journal of Cellular Biochemistry. 107 (3): 448–59. doi:10.1002/jcb.22141. PMID 19350539. Baldwin AS (1996). "The NF-kappa B and I kappa B proteins: new discoveries and insights". Annual Review of Immunology. 14: 649–83. doi:10.1146/annurev.immunol.14.1.649. PMID 8717528. Clarke R, Liu MC, Bouker KB, Gu Z, Lee RY, Zhu Y, Skaar TC, Gomez B, O'Brien K, Wang Y, Hilakivi-Clarke LA (Oct 2003). "Antiestrogen resistance in breast cancer and the role of estrogen receptor signaling". Oncogene. 22 (47): 7316–39. doi:10.1038/sj.onc.1206937. PMID 14576841. Bhatt D, Ghosh S (Feb 2014). "Regulation of the NF-κB-Mediated Transcription of Inflammatory Genes". Frontiers in Immunology. 5 (71). doi:10.3389/fimmu.2014.00071. PMID 24611065.